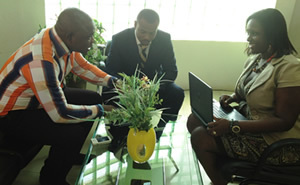 Cleanlife Ghana Limited was founded 20th November 2008 to bring hope to the teething Ghanaian janitorial industry. As a versatile business entity, we have also endeavored into the supply of various items: Cleaning Machines, Guard Tour Devices as well as Computers and their accessories. We have resolved to be the market leaders, our services and training programs are designed as a total package; hence our firm is one stop shop for everything cleaning. We are determined to offer every client "a total cleaning experience... we guarantee sparkling cleaning! We reckon the test every cleaning operative of Cleanlife seeks to pass is whether his service is worth the cost. Providing the highest quality, most up-to-date professional cleaning at the best possible price, are contemporary tools in our service design and delivery. Our staffs are the most outstanding players in our success story. With over 117 cleaners across the country and counting, we are resolute to stay on top. As market leaders, we ultimately must persevere in all facets of our operations; offering training for directors and cleaning staff at the least opportunity. Our huge investment in training is a key ingredient in our better staff retention, greater commitment and better efficiency. We regularly receive feedback on the work progress of each worker and at every appraisal, we discuss their training and improvement needs. We ensure faultless security at the client’s premise; our cleaners are taken through background checks by the Criminal Investigation Department of the Police. However, we have also in place an investigative, welfare and legal team that handle any such unpredicted behaviors exhibited by our staff which we seldom experience. Cleanlife is the new age company that avoids all possible errors: hence, we prepare precise and exclusively tailored program for each client eliminating all guesswork. Our cherished clients are the greater stakeholders in our business, our pledge therefore is to provide them ‘a total cleaning solution for their utmost satisfaction. Come to us for everything cleaning... and you will be glad you did! To build a state-of-the-art cleaning firm that understands the prevailing domestic and community sanitation needs. Explore innovativeness for cleaning offices, homes, warehouses, hospitals, schools and other institutions having national reach beyond the major cities, in every town and village. That with proficiency in applying contemporary and local ingenuity, our firm intimately will be a force to reckon partnering government and major stakeholders in areas of domestic and broad-community sanitation management.